‘The neighbourhood became brighter. There are more street lamps and flower gardens. Since then the residents feel the improvement in the area,’ the man said. ‘Now we know even more about our neighbours,’ he smiled. These residents of Suwon’s Haenggung-dong neighbourhood were reflecting on the EcoMobility World Festival held in the South Korean city in 2013. It was a month-long celebration that freed their community from cars and – by encouraging walking, cycling and the use of public transport – showed residents that a different, healthier way of urban life is possible. At first, it was a tough sell to a car-dependent city and neighbourhood. Local shopkeepers, angry at being inconvenienced by the construction work to widen the sidewalks when preparing for the Festival, and worried about how a four-week-long ban on cars would impact their businesses, staged a public protest. But they, too, soon became supportive. Another, a new business owner at the time, couldn’t hide his delight as he described how his profit more than doubled over the month of September as pedestrians flocked to the neighbourhood. The Festival, the brainchild of global city network ICLEI – Local Governments for Sustainability, was a great success. And even though cars once again were free to travel in the area when it finished, it inspired local residents to come together and demand the city make improvements, including having car-free streets on weekends and reducing local speed limits. Now two years on, and buoyed by Suwon’s positive results, South Africa’s Johannesburg is gearing up for the 2015 EcoMobility World Festival being held this October – which organisers say will build and improve on the South Korean experience. The host will be Sandton, one of Johannesburg’s central business districts. A select number of streets in the neighbourhood, considered the most important financial district in South Africa and home to the Johannesburg Stock Exchange, will be closed to personal cars for the whole month. Cycle rides, fun-runs, pop-up parks and restaurants – together with music and food festivals along the car-free streets – await visitors to the Festival. It will also include an exhibition showcasing local and international innovative trends in sustainable urban mobility, such as electric vehicles and pedi cabs. Instead of driving private cars, residents and workers will be encouraged to go about their daily lives on foot, by bike or using public transport. The city will ensure that there is adequate alternative transport and will provide support to freight deliveries and emergency services. Naturally, this raised eyebrows among Sandton citizens. But as with its South Korean predecessor, Joburg has been involved in an extensive consultation and planning process – engaging with residents, property owners and businesses – to present the ideas of the Festival and to answer any questions or concerns they may have. And as with Suwon’s widened sidewalks and the citizen-inspired mobility improvements, it is hoped that the Festival will also leave the city with a legacy. Significant changes are coming to Sandton, Alexandra and the surrounding areas with the introduction of South Africa’s ambitious Rea Vaya infrastructure project, which will make public transport, walking and cycling easier, safer and more affordable. Mayor Tau has also dedicated a fleet of 150 new Metro buses to be part of the Festival, which the city has retrofitted with environmentally friendly engines. Tau hopes that the public will be inspired to follow suit and retrofit their private vehicles. ‘Most of the public space of a city is dedicated to motor traffic,’ said Konrad Otto-Zimmermann, former ICLEI Secretary General and the initiator of the Festival concept. Otto-Zimmermann said that many local governments are planning improvements, which can be incremental or radical – or somewhere in between. Initiatives such as the EcoMobility World Festival, however, allow local communities and cities to see how life could be in a future where urban space and transport infrastructure work for the benefit of all residents. 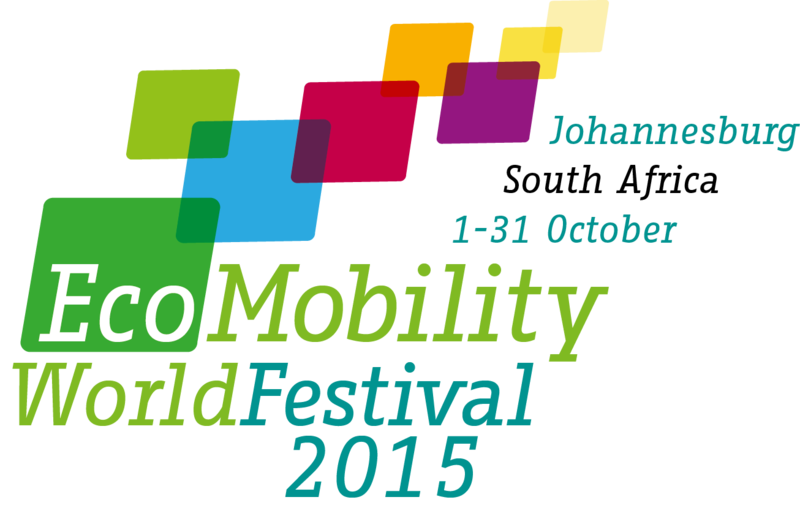 For more information about the EcoMobility World Festival 2015 in Johannesburg visit the official website. To read about the Suwon EcoMobility World Festival 2013, visit the website or watch the short documentary.